Great News Out of Canada This Week! There is popular support and little opposition to a parliamentary review, with 33% saying they are in favor, 26% neither for nor against, and only 19% opposed. Now we will determine if Canada’s 308 Members of Parliament are willing to represent their constituents on this issue. Similar to our 2013 poll, almost three times as many people suspect controlled demolition rather than fires after viewing video footage of WTC 7’s destruction. More than half — 52% — are either sure or suspect it was a controlled demolition, while only 18% are sure or suspect destruction by fire. In terms of whom they’re more likely to trust, 45% are more inclined to believe critics of the U.S. government report, who cite evidence that explosives were used, versus only 16% who are inclined to believe the government's story. Based on these results, it is clear that Canadian and American elected officials and members of the news media are operating in a different reality from almost everyone else. Nevertheless, it is our mission to keep up the pressure, and these results will be of great use to 9/11 activists — particularly in Canada, where the push for a parliamentary review continues ahead of the procedurally imposed January 17th deadline. Next week we will mail the results to every Member of Parliament, while continuing to contact every Canadian media outlet. 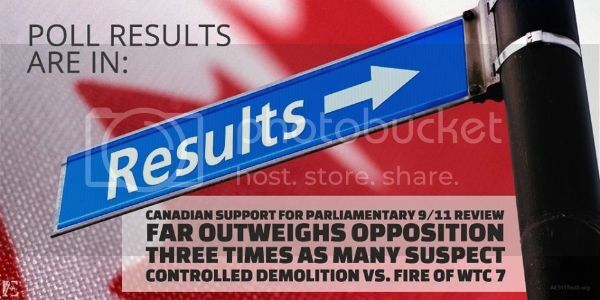 Visit http://rethink911.ca/poll-of-canadians-finds-popular-support-for-parliamentary-review-of-911-commission-report/ to view the full results and press release. Thanks for making this one possible!